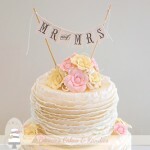 One of my February brides designed her own wedding cake, and I’m pleased to share her vision brought to life through icing with you today! 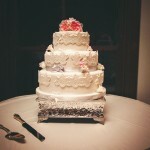 With the wedding to be held in Imbil in the Mary Valley, I met with the bride the day prior to hand over her cake. Not shown in my photos below is the cake topper that would add the finishing touch. A double-heart diamante cake topper was to be placed on top on the day, and I bet it would have looked just wonderful, tying in with the diamantes around the base of each tier! The bottom and middle tiers were quite dark and dramatic with their black fondant covering, but brightened up with the green ribbon and touch of ‘bling’ with the diamantes around the base of each tier. 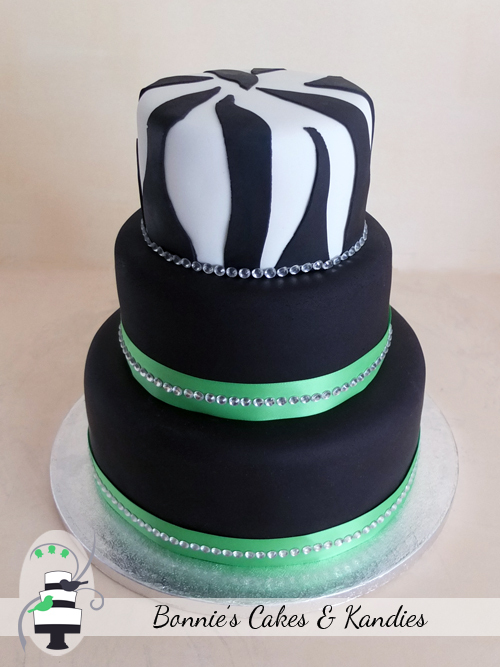 The white space created by the zebra print on the top tier helps to draw the eyes upward, and bring a fun and modern touch to the design. We can’t talk about cake without talking about flavours! The top and bottom tiers were made in my very popular dark chocolate mud cake, with the middle tier made in carrot cake. 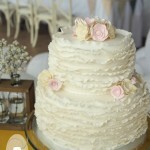 I love carrot cake as an unexpected but delicious flavour for wedding guests to enjoy. 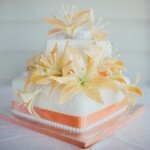 I’m looking forward to making another carrot cake tier for an upcoming wedding cake in May this year! 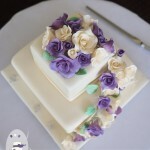 Very best wishes to the happy couple who enjoyed the cake I have featured today. Thank you for choosing Bonnie’s Cakes & Kandies. I wish you all the very best for a wonderful future together!